The Standard Model of particle physics, sometimes called "The Theory of Almost Everything," is the best set of equations to date that describes the universe's fundamental particles and how they interact. Yet the theory has holes—including the absence of an adequate explanation for gravity, the inability to explain the asymmetry between matter and antimatter in the early universe, which gave rise to the stars and galaxies, and the failure to identify fundamental dark matter particles or account for dark energy. Researchers now have a new tool to aid in the search for physics beyond the good, but yet incomplete Standard Model. An international team of scientists has designed and tested a magnetic shield that is the first to achieve an extremely low magnetic field over a large volume. The device provides more than 10 times better magnetic shielding than previous state-of-the art shields. The record-setting performance makes it possible for scientists to measure certain properties of fundamental particles at higher levels of precision—which in turn could reveal previously hidden physics and set parameters in the search for new particles. 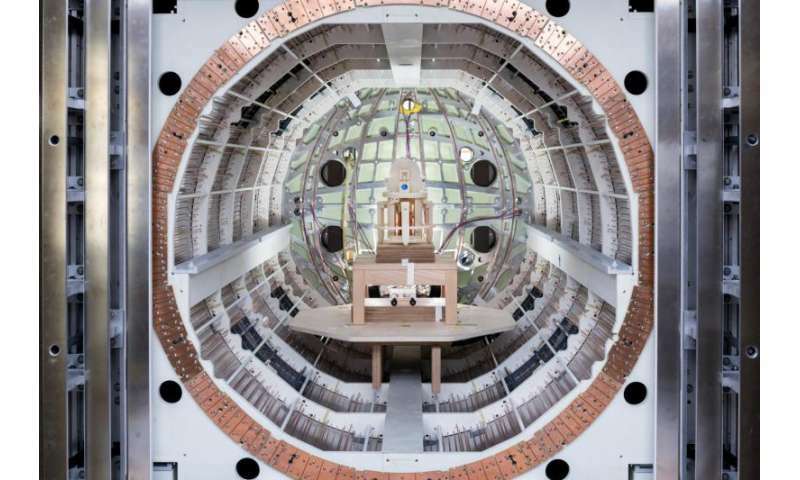 The researchers describe the new magnetic shield in a paper in the Journal of Applied Physics. High precision measurements are one of three frontiers to search for physics beyond the Standard Model, explained Tobias Lins, a doctoral student who worked on the new magnetic shield in the research lab of Professor Peter Fierlinger at the Technische Universität München in Germany. The precision measurements complement other methods to search for new physics, including slamming particles together in a collider to generate new, high-energy particles, and peering into space to catch signals from the early universe. "Precision experiments are able to probe nature up to energy scales which might not be accessible by current and next generation collider experiments," Lins said. That's because the existence of exotic new particles can slightly alter the properties of already known particles. A tiny deviation from the expected properties may indicate that an as-yet-undiscovered fundamental particle inhabits the "particle zoo." The researchers built the new shield out of several layers of a special alloy, composed of nickel and iron, that has a high degree of magnetic permeability—meaning it can act like a sponge to absorb and redirect an applied magnetic field, like the earth's own magnetic field or fields generated by equipment such as motors and transformers. "The apparatus might be compared to cuboid Russian nesting dolls," Lins said. "Like the dolls, most layers can be used individually and with an increasing number of layers the inside is more and more protected." The team's big breakthrough came from in-depth numerical modeling of the arrangement of the precision treated magnetizable alloy, resulting in significantly optimized design details, like thickness, connections and spacing of layers. The materials in magnetic shields change their magnetization due to environmental influences, like temperature changes and vibrations caused by passing cars, and these shifts can be passed to the inside of the shield. The thinner sheets in the new design enabled a better balancing of the magnetic field in the metal, resulting in the smallest and most homogenous magnetic field ever created within the shielded space, even beating the average ambient magnetic field of the interstellar medium. Plans are already underway to use the new magnetic shield in an experiment to test limits for the distribution of charges (called the electric dipole moment, or EDM) of an isotope of xenon. An EDM that is higher than predicted by the Standard Model could signal the existence of a new particle whose mass is linked to the amount by which the EDM deviates from the expected value. The researchers also want to use a modified SQUID detector—which can detect extremely subtle magnetic fields—to search for long theorized, but never detected magnetic monopoles. Within the magnetically quiet space inside the shield, a monopole passing by the SQUID might produce a magnetic field higher than the background noise level, Lins said. Matter (plus charge) and Antimatter (minus charge) are balanced inside the photon. Since nucleons are composed of +/- beta pairs, and electron shells seek a balance of charges, there is already a supersymmetric relationship between all matter and antimatter. Anti-hydrogen atoms and other anti-atomic configurations are not necessary to understand the inherent supersymmetry of all matter in the universe. i.e. the effective location of the proton and the neutron, based upon present diameters, implies a given force to separate. I would speculate that we could measure the distance from Proton center to electron center, by defining the separation force. Note: mass may be removed, simply, allow only 1/2 charge counts, divide out the mass, its unnecessary! Sorry, don't get what you are doing. Looking for gold in a copper mine? Anybody who puts the least credence in the possibility of magnetic monopoles is simply a crank who doesn't understand electromagnetism. All four of Maxwell's equations in relativistic (Lorentz-invariant) form reduce to the simple requirement that the gradient of the field is equal to the four-current (a 4D multivector (Clifford / Geometric Algebra (GA) entity) which combines charge and current). The overall electromagnetic field combines both vector (electric) and bivector (magnetic) components, with the split between the electric and magnetic fields depending on the relative motion of the "test" or "observer" four-current to the other four-currents. Timmy wrote, "Matter (plus charge) and Antimatter (minus charge) are balanced inside the photon. Since nucleons are composed of +/- beta pairs, and electron shells seek a balance of charges, there is already a supersymmetric relationship between all matter and antimatter. Anti-hydrogen atoms and other anti-atomic configurations are not necessary to understand the inherent supersymmetry of all matter in the universe." Thanks for solving the matter-antimatter asymmetry problem, Timmy. Physicists are sure to be grateful. They had no idea that photons are made up of balanced matter and antimatter. It was nice of you not to call them 'fools' and 'dunderheads' for missing what you, with your superior intellect, knew was obvious. Your Nobel Prize is assured. All you have to do to collect it is to submit your paper to a peer-reviewed journal, then watch physicists' jaws drop in astonishment and admiration. Got your acceptance speech ready? "You shall not find any new physics, because all physical events are interpreted well-known particles (leptons, quarks, and gauge bosons) and forces which have long known (electroweak, gravity, strong interactions)." Gunnqu quotes Quznetsov, "You shall not find any new physics, because all physical events are interpreted well-known particles (leptons, quarks, and gauge bosons) and forces which have long known (electroweak, gravity, strong interactions)." Guess Quznetsov never heard of the twenty orders of magnitude between the quark scale and the Planck scale - that's more orders of magnitude than exist between our scale and quarks - or if he has, he thinks physics doesn't happen down in those weeds. And he hasn't heard about the incomplete reconciliation of relativity and quantum theories, or the unsolved matter-antimatter asymmetry, or the unexpectedly strange motions of galaxies which require unknown physics to explain, or the apparent accelerating expansion of the universe, which points either to new physics or errors in the physics we know. Honestly, I've never read a more ridiculous statement from a physicist in my life. It's dark mass, not dark matter. Physicists are starting to realize the notions of dark matter and the dark matter particle are incorrect. They are referring to the mass which fills 'empty' space as the 'dark mass' in order to distinguish it from the baggage associated with dark matter. "That is, all that we are certain about [is] the dark mass, not dark matter, let alone to say about the dark 'particle'." Particles of matter move through and displace the dark mass, including 'particles' as large as galaxies and galaxy clusters. The Milky Way moves through and curves spacetime. The Milky Way moves through and displaces the dark mass. The state of displacement of the dark mass *is* curved spacetime. 2. The link proves that what Quznetsov said is absolutely true and unassailable. Think I'll go with number 1. We aren't done discovering physics. We've got a great start on it, but the job is a long way from completed. And anyone who thinks it's a wrap - I don't care what his credentials may be - is a raving lunatic. I'm beginning to to lose my mind! Idiots! First define a correct measurement based upon a matter, of a mass, of charge. Then argue a point of what we do not understand. Or keep trying to understand cosmic rays with that bubble in your mind as reality. Gravity? What are we? Neanderthals! To Urgelt: Your snide remarks are typical of those who have no other basis for argument. However, check out QCD if you are interested in understanding the dipole nature of the photon. Photon! Simply a field event! What are you talking about, a field with motion in time relative to you? Or some magical particle, like pixie dust? Yes it comes in different colors! Timmy wrote, "To Urgelt: Your snide remarks are typical of those who have no other basis for argument. However, check out QCD if you are interested in understanding the dipole nature of the photon." But in his earlier comment, he wrote, "Matter (plus charge) and Antimatter (minus charge) are balanced inside the photon." There is no resemblance between your opinion and QCD. None whatsoever. And so you cannot support what you said by referencing QCD. Nothing inside of a photon can be called 'matter' under QCD. And matter does not have to be positively charged, and antimatter does not have to be negatively charged. Honestly, your first comment is stunning in its ignorance of basic physics. If you are determined to post ignorant comments in a public science forum, you are inviting snark. Really, you are. QCD describes the strong nuclear force inside a nucleon (quarks gluons interaction) it also describes de strong interaction (nucleus cohesion) but in no way can it describe a photon. The photon is a carrier of the electromagnetic force. What do you need the necessary or the sufficiency part? Urgelt, You are a real dummy if you expect to spout your BS without anyone realizing that you don't know jack about QCD. Also, your attitude is contrary to any reasonable research technique, which explores all realistic possibilities without the preconceived notions that you claim are set in stone. If you are affiliated with this site, I will track you down and file a formal complaint. In the meantime, I would advise you to do a little research into the area of wave-particle duality. There's a lot of good science going on, and if there were not so many unanswered questions, the new accelerators wouldn't be necessary. The standard model has many deficiencies, and the above referenced model answers many of them. Of course, i wouldn't expect such a rigidly stubborn individual, such as yourself, to admit it. Hey Timmy, do you notice how all of your comments have one star, and Urgelt's all have 4 or 5? It's not a conspiracy; it's because you don't know what you are talking about, and Urgelt does. Photons are not massive particles. So using the modified SQUIDs is a good idea, as it will put strong constraints on some of the more "exotic" theories that posit the existence of magnetic monopoles, which would be quite a trick, as EWH mentioned. Where did you learn word salad, rufus? Or does it just come natural for you? Something like holding a neutron from a string as a pendulum within the "field" of the earth ... nice start, but I would make my measurements of the elemental in space! This measurement is about the earth, I'm imagining a practically infinite response, i.e. 1/0+ wavelets of low amplitudes all summed together as a 2nd mode, 1st mode is a stable mode, i.e. the stability of the dipole ... gravity! So yea, same measurement, mass, but now as a charge pair [1,-1] and the field throughout space and time based upon a unit-less space, i.e. 4D simply from interpolating the change in position of each charge of which we are a part. We never see more than our own reflection, truly, if we do not flatter ourselves! Considering it is something we do not know then suggest you have not read enough or are guided by fantasy. Logic: Universe of Discourse - All statements either true or false, definable from set of axioms and theories derivable using known logic. (oops, ran out of space) ....that is, model. Carlo Rubbia seemed to like the idea of the photon structure in 1980, at least that's what his letter to me said. BTW, rufuswarren, thanks for the intelligent remarks. Oh, are you referring to the two experiments which are actually the same experiment: double slit with only waves and the other with only particles, i.e. the source of the waves; therefore, particles have wavelike behavior as well as waves having particle like behavior. Kind of silly when you think about it; however, Einstein was in granularity theory before he met his first wife. Think she was dismissed as a student. She and he worked on GR. Kind of interesting, idiots like everything when having ... Thanks. Just think, if you know the length of a stick traveling past you, then why can't you see a wavelet pass using the same measurement. Are we so dazzled we need to redefine space? How fast did it pass. Well all I have is this "priori" , its original wavelength, space must have stretched cause it shudda been c? What! We know the length from end to end and the time it takes to completely pass, i.e. how fast it is moving relative to us and may be from +/- infinity! Do I( get an award for disproving Einstein? Or is everyone too embarrassed to admit it? Hey, the monies in the pot got play your hand! Does a photon have rest mass? If so, how do you bring a photon to rest? This field! If only in free fall and some really groovy nano-particles!